Two months of ownership of my NT650, and the rose-tinted visor has lifted enough for me to see the reality of this union. While it remains enjoyable to ride to this day – as of riding it to work this morning as I’ve been doing daily – I’ve now had enough repeated seat time to find and feel the nuances of this motorcycle. Writing this entry is going to feel like being in marriage counseling, and I’ve just been asked by the counselor to point out what bothers me about my partner. This is probably both the narrowest and lightest bike I’ve owned to date, but the fuel tank suffers due to this as its shape and form effectively follows the twin-spar aluminum frame, which are spaced only far enough to hug the perimeter of the narrow v-twin engine. This means that the fuel tank has a measly fuel capacity of 3.2 gallons, half a gallon of which is for Reserve. That effectively leaves about 2.5 gallons only for main consumption; that’s paltry. My 2002 Yamaha R1 boasts a common-place 4.5 gallon for a bike of its like. 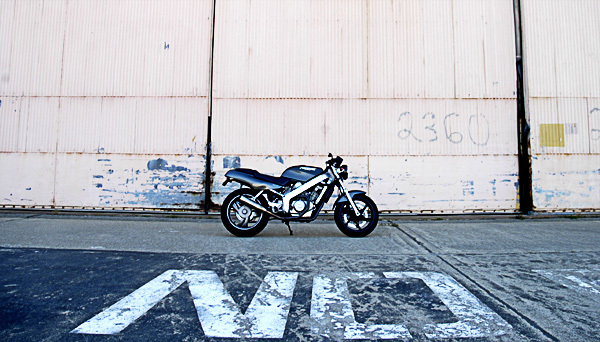 It’s only because the NT650 yields me a fuel economy of about 42-45 miles per gallon to my R1’s 35-37 miles per gallon that the frequency in which I refuel both bikes remains the same during a work week, albeit with a little help from the Reserve of the NT650. The narrow profile of the fuel tank also provides little support for me when straight riding. Whereas the larger fuel tank of the R1 leaves both my thighs naturally hugging it at rest, I have to consciously fold my legs inward if I want to feel myself gripping the NT650’s tank. It’s roomier, of course, but whereas I’ve been used to the R1’s tank effectively aiding me in propping my body up, the NT650 doesn’t do the same. And because the bike is so narrow, one of the first things I did when I took it home from the previous owner was rotate the clip-ons outward, giving me a wider stance on the bike, and thus giving the bike and I a larger profile on the road. But I eventually found this discomforting during long rides on the freeway, as the wider stance puts more pressure on my shoulders and inhibits my core from doing a better job at holding up my body against the crosswind. I’ve rotated the clip-ons inward again for more comfort ever since. But you know what? These things I’ve noted so far aren’t cause to break a union. While I could do with a larger fuel capacity, doing any kind of long rides should be broken up every 100 miles anyway for riding breaks and to stretch yourself out, and the NT650 will make those 100 miles between fueling up just fine. And while the narrow tank offers no support to me until I hug it with my legs, that’s a livable compromise in exchange for more ventilation to my lower body during warm to hot rides. The overall slim profile of the bike, coupled with the smaller fuel capacity that leaves less mass atop the motorcycle also keeps it nimble when I need it to be. Besides, marriage isn’t about changing one another completely, but rather compromising and accepting things that you cannot change. After all, I should’ve known what I was getting into before buying this bike, and while there are improvements to be made that would not only better my experience on the bike, but improve the bike itself, there are just things that I have to accept, and perhaps adapt to, to continue enjoying the motorcycle. But the true test of this relationship is about to come: A three-day motorcycle rally from the Bay Area to Quincy, CA. It’ll be my first time doing any kind of a rally, and only my second time doing a multi-day ride since the first one in October 2010. This trip will arguably be one of the biggest tests for the bike and I. This will be real-life living with one another after the honeymoon.